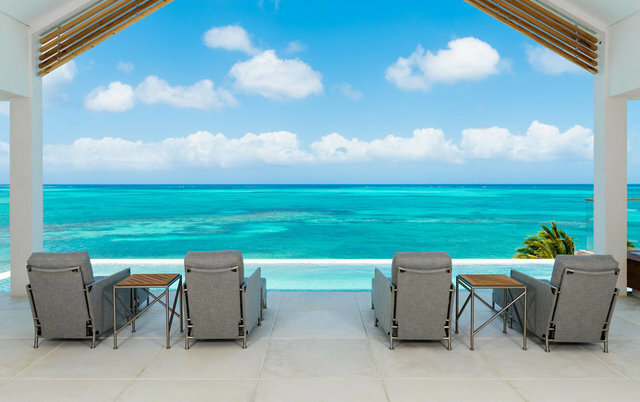 BEACH ENCLAVE VILLA 6 - An elevated villa experience that offers the perfect blend of footprints-in-the-sand living and majestic views of Providenciales' North Shore. This magnificent, unique and all one level layout is custom 4-bedroom design featuring an extra large oceanfront office and media/lounge room off of the great room and open kitchen. The villa also features extensive custom millwork, entertainment bar, bespoke ultra-high-end furnishings, and its own beach deck on the site's 104-foot stretch of beach frontage, and beach lounge with deck and wet bar, outdoor shower and fire pit. Perched 40' above the beach, the exclusive villa is serviced by Beach Enclave, set in a gated community, with gym, yoga, new elevated oceanfront bar and eatery for owners and guests, security, owner's bar, on-site reception and 24/7 on-site management and concierge service. Spanning approximately 7,000 sq. ft. of finished areas including 3,450 of interior sq. ft. and 1,000 sq. ft. of covered terraces), with a garage, parking pergola, lushly landscaped and lit grounds, and standby generator also included on .92 acres. Villa 6's site is the easternmost Villa at Beach Enclave North Shore, with the largest acreage. The highly private enclave is situated within 10 minutes from Grace Bay's shopping and entertainment hub, and Providenciales International Airport and private air terminals. Click on the Matterport Link for a Virtual Tour of the home.